Beet greens are sweet and tender when harvested early, making them a delicious side dish high in vitamins and minerals. According to NutritionData, beet greens rate 92 on the completeness scale of 0-100, indicating that they are a nearly complete food packed with essential vitamins and nutrients. But gardeners know their real value is in their unique flavor. Harvest beet greens (the young tops of beets) when they are 4 to 6 inches tall. Pull the entire plant from the soil and shake to remove soil from the roots. Some may contain small beets at this point, but most have a tiny swollen root. These baby beets are packed with flavor and are often coveted by children and adults alike. Wash beet greens thoroughly in cold water. Place the greens in a large bowl and cover with cold water. Swish the greens to dislodge any remaining soil. Drain the water. Rinse the greens under running water to remove traces of soil. Beet greens that are improperly cleaned may be gritty from the garden soil. Inspect the leaves. Look closely for any discolored or yellowed leaves or any signs of insects. Remove the effected leaves. Watch for tiny white patches on leaves that may indicated insects inside the leaves. Trim the roots. Use a sharp knife to trim the fine hair roots at on the beet greens. The swollen root should be left intact, as this is sweet and tasty adding flavor to your beet greens. If your beet greens have small beets, trim the beet from the greens--but leave at least 1/2 inch of the stems attached to the beet, otherwise the coloring in the beet will leach into the water and the beet will lose its bright red appearance. Bring water to boil in a saucepan. Add the beet greens to the boiling water and cook until they are tender--about 10 minutes. Some prefer to cook beet greens with potatoes. If you choose this route, wait until the kettle of potatoes is almost fork tender to add the beet greens. Drain the beet greens. Place in a serving bowl and top with a pat of butter and season to taste with salt and pepper. Serve beet greens with potatoes and meat or poultry. Remove the skin from the roots before eating by gently squeezing the root between your thumb and forefinger to slip the tiny beet from the skin. Discard the skin. Considerations: Beet greens shrink when cooked. They may be reduced in volume to ¼ -1/3 the original amount. Stringy beet greens result when the beet tops have been allowed to grow too tall. As they mature, the leaves toughen and the stems become stringy. If you choose to use more mature beet tops for beet greens, trim away the stems and use just the leaves. 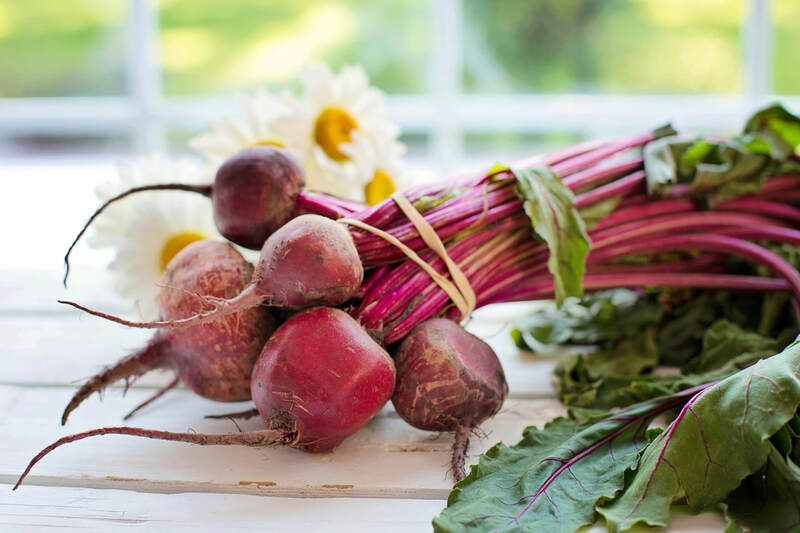 Flavor will be reduced, but older beet tops are still a good source of vitamins and minerals. Potatoes cooked in the same pot with beet greens will turn red as the coloring from the beetroots leach into the water and colors the potatoes. Potatoes also pick up a slight beet flavor.